2 "African Americans and the 1996 Elections." Salim Muwakkil is a Chicago based activist. 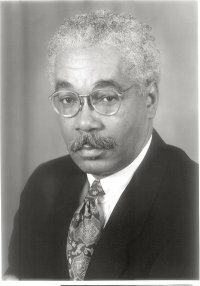 In 1987 Salim Muwakhil was on the Board of Directors of the Black Press Institute. In March 28-30 1997 Democratic Socialists of America convened their annual Socialist Scholars Conference at Borough of Manhattan Community College, New York. The conference was themed "Radical alternatives on the eve of the millenium". Invitees were asked to join Doug Henwood, Robert Heilbroner, Paul Sweezy, Harry Magdoff, Bill Tabb, Frances Fox Piven, Robert Fitch, Jane Slaughter and Ellen Meiksins Wood "as they debate changes in the labor movement, Marxist theory, the state of the economy, market socialism, and other areas where theory and practice meet". In March 1998 “Endorsers of the Call” to found a Black Radical Congress included Salim Muwakkil, Chicago. 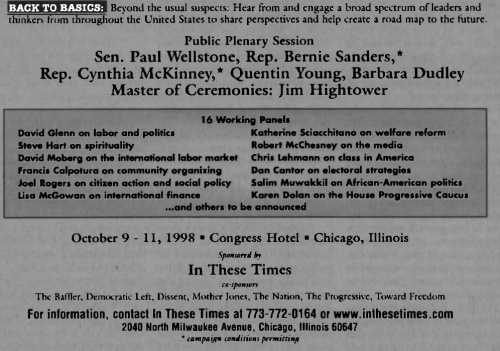 On April 28 2000, the Sacramento Democratic Socialists of America Local hosted a regional Harrington-Hamer Institute training in media skills and community organizing featuring John Nichols of The Nation and Salim Muwakkil of In These Times. On Saturday evening, there was a second plenary panel, titled “The State of Black Politics.” The panelists were Linda Burnham (Women of Color Resource Center), Theresa El-Amin (Southern Anti-Racism Network, Solidarity), Bill Fletcher, Jr. (TransAfrica Forum), and Salim Muwakkil(Chicago Tribune, In These Times). Barbara Ransby, UIC, African-American Studies (moderator). At the August 2002 18th Young Democratic Socialists Summer Institute and National Convention at the University of Illinois at Chicago, Salim Muwakkil, of In These Times, spoke on Race in America after 9/11. As of 2009 Salim Muwakkil was a Senior Editor of Chicago based socialist journal In These Times. This page was last modified on 19 January 2016, at 22:30.